Click on a Supreme Court Justice's name below to see their stances on the issues. Nominated by President George W. Bush on Oct. 31, 2005. Nominated as Chief Justice by President George W. Bush; seated Sept. 29, 2005. Nominated by President Nixon; seated January 7, 1972. 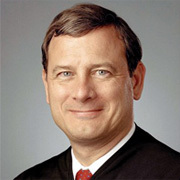 Nominated as Chief Justice by President Reagan, he assumed that office on September 26, 1986; deceased Sept. 4, 2005. Nominated by President Ford; seated December 19, 1975. Nominated by President Reagan; seated September 25, 1981; announced retirement July 1, 2005. Nominated by President Reagan; seated September 26, 1986. Nominated by President Reagan; seated February 18, 1988. Nominated by President Bush; seated October 9, 1990. Nominated by President Bush; seated October 23, 1991. Nominated by President Clinton; seated August 10, 1993. Nominated by President Clinton; seated August 3, 1994.